I realise that several other posters have been to Costa Rica so I'll attempt to highlight the differences for a large group (9 in our case) flying boats from the U.K. 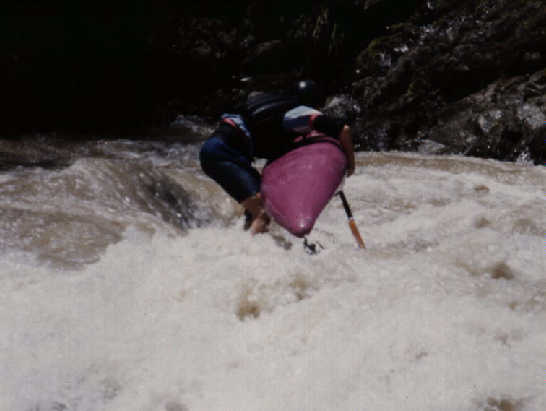 This trip took place at the end of the rainy season, 9th-26th October 1994, so we also had high(ish) water throughout. Between us we were quite experienced, with only one paddler with no experience outside the Alps. The rest of us claim: Turkey, Norway, British Columbia, Grand Canyon, Nepal, Zambezi and Chile on our curriculum vitae. 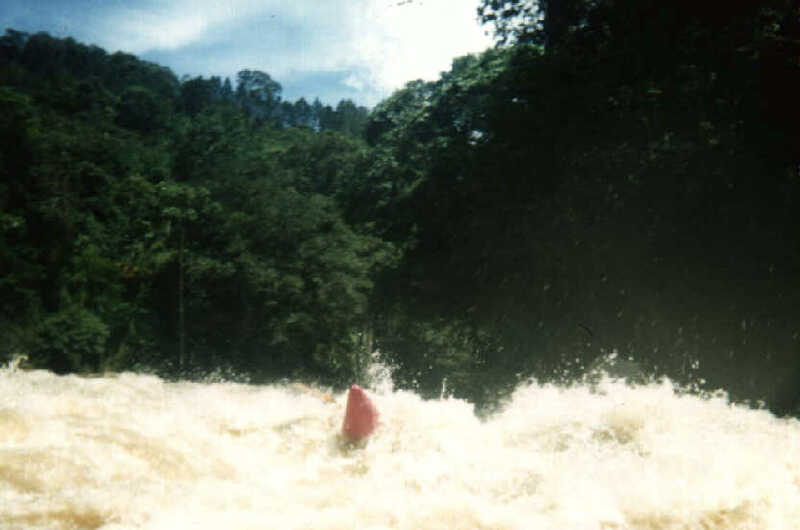 For simpler approach, why not try Rios Tropicales, a very major raft firm come kayak hire company. In general a large unsupported trip to Costa Rica is very easy to run. For a (supposedly) third world country the roads are excellent, medical facilites are available, hotels are clean and the food and water are edible. No detailed knowledge of Spanish is required, the locals are very friendly and invariably helpful. If you want to try remote paddling then we all felt this was a good place to start out. Getting there: We flew with American Airlines from Heathrow to San Jose via Miami carrying our boats both ways free of charge. tip: don't pay for the flights until you have a letter to this effect, $7500 is a powerful incentive. Getting around: With nine people using local buses and hiring taxis is impossible. We hired two 4-wheel drive isuzu jeeps for $90 a day. To us this seems quite a reasonable price. We made careful notes of all the prior damage and actually got $5 back at the end from the hire company. Obviously they are looking to take you for all they can, but a little careful thought and repeatedly pointing out that you are 'not american' solves those problems. Driving around, particularly after dark, is an experience likened to playing on a space invader. Many potholes are over 6 inches deep. tip: get a good map before you arrive. We had a 1:650,000 map of the entire country which really didn't suffice. Lots of `Donde este ....' and rapid hand waving plus some psychic navigation definately required. Using local transport to get to and from rivers would appear to be tricky, with a single vehicle hitching or getting a taxi to run the ferry seemed to work if you were prepared to wait around. Our general impression was thet the raft companies were less helpful than elsewhere but this may be due to the high leech density (see Turrialba below). Guide (Mayfield + Gallo): Sorry, this is the worst guidebook any of us have ever seen. Even the put-ins and take-outs are flaky, not mentioning the obvious road if the option is to pay a raft company. Sections are laughably overgraded (maybe due to grade deflation since the guide was written ?? ), leading you to make potentially dangerous decisions. Luckily everything we did was consistantly bad (take off at least a grade and ignore any level warnings). 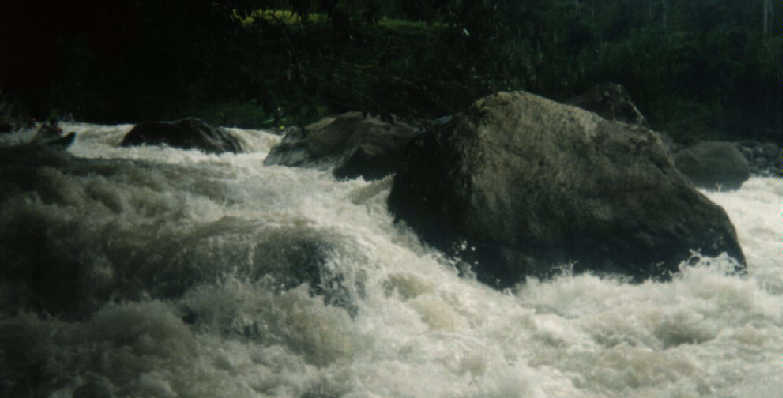 (gauge readings are for Angostera Bridge on the Reventazon, Huacas falls on the Lower Pacuare and at the put on for the upper Pacuare, all the gradings are ours, include all the usual disclaimers). In reality IV with three V bits, but wouldn't want to portage them. You can sneak Jungle Run (which looked nasty) down the left at this level. My favourite section, chunky IV with some monster holes, felt more continous than Peralta. At this level you can play comfortably, most of the monsters have gone leaving some nice waves. Guides 1.55-1.65 seems very dubious (far too low). Very scenic. Get on down a 4WD track 2 miles upstream from the guides 'mule track'. Nothing down to the guides rapid with a tree in it (which is still there). We portaged this (hate trees). Jumping Bobo was protected by two nasty stoppers at this level. Guides timing is all wrong, 7 of us got on at 11:30, spent an hour eating a packed lunch and still finished before 5pm. The section map is also a complete fiction, lots of fun in the 'third canyon'. Upper Orosi, IV, 15 cms ? Far easier than the guide makes out, bit of a scape at this level. Lower Orosi, III, can't remember but a lot higher than the guide recommends. Short float, cold water as most of it comes in just upstream from a dam outfall. Lower Balsa, IV, 30cms ? Get on half a mile below the dam site by driving into the hotel grounds, follow the 'To the river' signs. Excellent pool drop section. Don't bother, not enough water or mental , Balsa is near Fortuna. Long slog but saw crocodiles in the river. 2 feet slow break, sea was so warm just needed shorts. Haggling etc: Unlike most third world countries we've visited haggling does not seem to be a way of life. The price you get quoted is usually (but not always) close to the going rate. Don't expect much more than 10 percent from haggling. Being able to speak spanish isn't necessary. Two of us speak very broken espanol, the rest got by quite happily, picking up the odd word and waving hands. 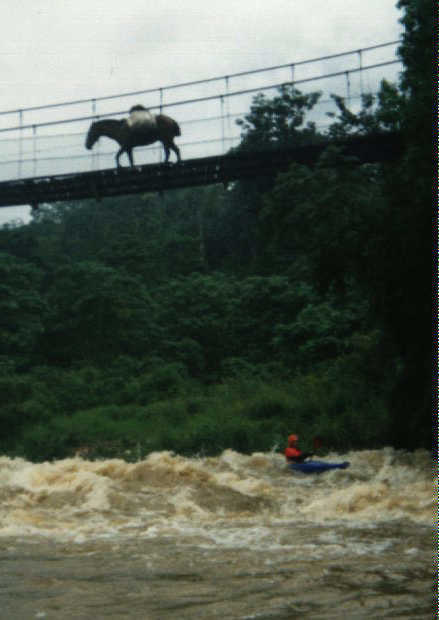 Turrialba: Haunt of far too many kayak bums paddling 'manyana'. All are keen to hear what you did today and are thinking of doing tomorrow, possibly so that they can pontificate about how good they are, mainly to try and leech river trips. When a group of them finally get their arses in gear to go and do the 'Upper, upper, upper Orosi' you invaribly see them back in town 2 hours later. The game seems to be wasting your life wandering aimlessly from bar to bar carrying a set of wooden paddles and a beat up old slalom bouyancy aid. Can't comment on how good they actually are, in the two weeks we were around none of them actually made it to a river.